This young girl is an inspiration to all of us who feel like they have two left feet, but more importantly to those of us who are so worried about what other people think. She is sharing her joy by dancing as she feels the music. She is very physically literate! A recent report has shown that Canadian kids continue to rank low in a global report on physical activity. Based off information from the ParticipACTION ReportCard Canada scored a D+ in categories that measure overall physical activity and sedentary behavior, and a D in the newest indicator, physical fitness. Children learn through play and one of the best places for that learning to take place is in the outdoors. Recent research shows outdoor play-based learning can also help improve educational outcomes by stimulating learning and improving concentration. For suggestions for how to get your kids outside click here. Click here to read about other spaces outside of the classroom where learning is taking place at your school! Physical education is often seen as a students opportunity to be active and have fun break from traditional learning. Although these are important components of physical education, it should also be recognized that PE has the potential to support learning and childhood development more broadly. PE gives students an opportunity to practice their problem solving, critical thinking skills and more in an active environment. Physical literacy is the motivation, confidence, competence, knowledge, and understanding to value and take responsibility for engagement in physical activity for life. - Canadian Consensus Group 2015. A recent study surveying of more than 10,000 Canadian children shows that only about a third have achieved an acceptable level of what's called "physical literacy." The American Academy of Pediatrics recently released a report detailing the importance of appropriate play in healthy childhood development. Research demonstrates that play is not frivolous. In fact, through play, children learn social-emotional, cognitive and self-regulation skills. Play is also the basis for forming safe, stable and nurturing relationships with peers and adults. Click here to read more on the Power of Play! Experts around the world agree that playing a variety of sports is more beneficial to children's development than specializing in one sport early on. A multi-sport approach allows kids to increase their physical literacy and reduce their chance of burnout or injury. Read more about the multi-sport approach here. If you are a teacher, you most likely find your students more attentive and ready to learn following an active recess. For example, think about your student's ability to concentrate following an outdoor recess versus an indoor recess. However, 73% of the average school day is spent sitting behind a desk. Wondering how you can incorporate more physical activity into your students day? The format is simple. Teachers incorporate short breaks (5-15 minutes) of physical activity into their lesson plan. Some teachers design their own active breaks while others rely on videos that lead kids through bouts of “active learning.” For more information read the full article here. Recent changes in automation have shifted the job market and resulted in fewer traditional employment opportunities. Companies have made suggestions such as retraining workers or offering a universal basic income, however, one group of CEO'S looked at it from a new science-backed perspective - play. Allowing children to take part in structured and unstructured play will help better prepare them for workplace and society. Small changes in our day to day lives can open up new opportunities to participate and enjoy play! Click here to read the full article and for suggestions on how you can support play at home and in school. Playground conflicts are all too common and often it is easy to roll our eyes at a situation or brush it off as a part of growing up. However, recent research has demonstrated that how kids handle conflict in adolescence can have long-term health implications. We know stress has a negative impact on our health as adults and the same can be said for kids. "The study, called 'The Body Remembers' and published in the journal Development and Psychopathology, found that a protein in the bloodstream that has been associated with development of cancerous tumours, osteoporosis, arthritis and other problems associated with aging, was present at high levels in the bloodstreams of 28-year-olds who experienced chronic social conflict beginning as early as age 13, but not among those who handled conflict well." What does this mean? Our body remembers the stress we experience in adolescence and it can have long-term impacts on our life. It is therefore important that we assist kids by providing them with the skills and tools needed for healthy conflict resolution. Tools such as a Conflict Resolution Circle can help kids decide how to resolve a conflict, helping mitigate some of the social and emotional implications of schoolyard conflict. Play is another way youth can learn and strengthen their conflict resolution skills and problem solving skills to help them deal with conflicts better later in life. Click here to read more on how schoolyard conflict impacts children's long-term health. It is important that children begin to develop their physical literacy from a young age. In the animal kingdom, parents instinctively develop physical literacy skills in their offspring shortly after they’re born (sometimes literally minutes after). Like humans, animals have to contend with gravity, fixed, and moving objects. We do so through using several types of movement such as: walking, running, jumping, galloping, swinging, or dodging. All mammals teach their young how to be physically literate – it’s a matter of survival! It is important as parents we remember the significance of physical literacy and support the development of physical literacy in youth starting from a young age. Science Says: Let your kids take risks while playing. It is good for them. Risky Play is NOT dangerous play and it’s NOT stupid play. In fact, if you are a certain age, risky play is what you did as a kid and we called it just play! We propose we begin to think of risky play as challenging play, play that provides an environment to grow physical and cognitive skills. What we find challenging differs from person to person and it is important to consider what level of challenge would be appropriate for your age group when facilitating play. As parents or educators, we often deter out children from participating in risky or challenging play for fear they will get hurt. However, through challenging play children are able to develop their resilience, self-confidence and much more. If children do not participate in challenging play it can result in unintended negative consequences, such as low self-confidence or a lack of willingness to try new opportunities or challenges. For more information on the benefits of challenging play click here. Have you ever wondered about the importance of play? In recent years research has discussed the decline in children's unstructured play time. There has been a concern because children learn so many important social and life skills through play. For example, how to problem solve, communicate, and build relationships with others. Recent research has shown that the decline in play can be linked to increased levels of anxiety and depression among youth. Currently, rates of anxiety and depression among youth are higher than ever and it is related to how youth learn and play. In order to combat rising anxiety and depression levels, we need to rethink how we motivate youth (extrinsic vs. intrinsic) and allow them more time to learn on their own through unstructured play. Through unstructured play, youth develop valuable problem solving, social, and self-regulation skills that contribute to good mental health throughout life. For more information on the decline in play, rise of anxiety and depression, and what you can do to help click here to read the full article. Teachers of the early grades have found themselves responsible for more and more academics and increasingly numbers of schools have limited or eliminated recess as the academic press took hold. Play and school have become incompatible. The very experiences that contribute to physical health, emotional development and that build cooperation and teamwork have shrunk away. We also know that children are spending more time on screens and less outdoors. For the little ones, of course, there needs to be time for play, exploration, running, and singing. They need active interactions with their peers and interventions from their teachers when indicated. Common sense. We celebrate those leaders who have stepped up and protected playtime. It is essential for developing children. But, there are other actions that can be taken as well. Don’t wait until January to start a New Year’s resolution. Start today and make it a lifestyle! Help with arthritis and other conditions affecting the joints, leading to improved pain control and better quality of life. This season don't let cold weather stand in your way of outdoor play! 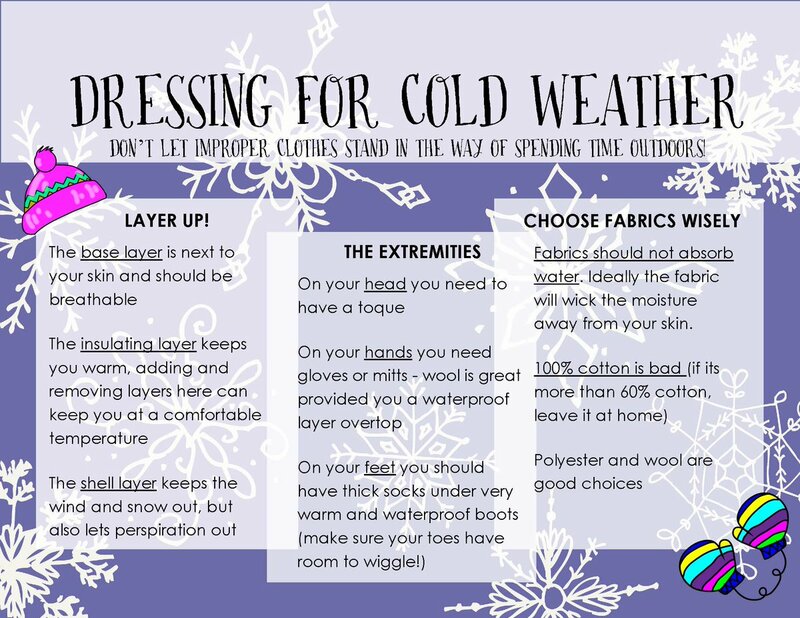 Click here for some tips on how to dress for cold weather, so that you and your family can play outside this season! This month Statistics Canada released a new study on Physical Activity among Canadian children. The study found that 20% of Canadian youth are not hitting the recommended targets for sleep, sedentary behavior and physical activity. The study also identifies several factors that influence children's physical activity, such as time outdoors and their parents activity level. For more information on the study results or access the full infographic click here. The whole child approach is becoming more and more popular in schools. To teach the whole child means to respect the four domains of well-being in the school environment. The four domains are: cognitive, emotional, social and physical. They are interconnected. That’s a great thing because it means every teacher is now just as responsible as the physical education teacher for improving the students’ health and wellness. If schools focus on developing the students’ physical literacy, they are subsequently striving to support their affective, physical, cognitive, and behavioural well-being. I am a grade five and P.E. teacher at École Élémentaire Publique Jeanne-Sauvé, in Orléans, Ontario. The following five pillars give all students at my school a better chance at improving their physical literacy. They are deeply rooted in my school’s culture. We’ve been lucky to have principals who strongly believe in the benefits of physical activity. My colleagues and I are all extremely active in our own unique ways. Students, parents and staff members love to learn and move. Our students have daily physical education or daily physical activity. This is when they get to develop their fundamental movement skills and sports skills. Physical education is mostly done in a gymnasium or outdoors . My colleagues and I rely heavily on Ophea’s Teaching Tools. The focus isn’t solely on sports. We often use stations and the Teaching Games for Understanding Approach to improve our students’ participation and quality of movement. Of course, sports are also played but gone are the days that we only play one sport a month at a time. Our intramural program allows grade four, five, and six students to participate in sports regardless of skill level. They have a chance to play in a friendly, positive, and inclusive environment because we’ve committed ourselves to the True Sport Principles. Before the intramurals program, typically, only the most athletic students participated in sports outside of physical education class. That meant only a handful of students played and improved. With the addition of our intramurals program, we’ve noticed a huge increase in participation. For example, we have over 100 students who participate in our volleyball and skating intramurals. Skills for various sports are introduced in both physical education class and through intramurals. After having a chance to practice, our students can decide if they want to try-out for the various sports teams. If selected, they can participate in the school board tournament. There have been many interesting debates on social media lately about cutting children. Russell High School has an innovative and inclusive approach for selecting students. Students who show up get to play. That’s an excellent approach. Schools are supposed to be inclusive. Having intramurals or a sports program like Russell High School are great ways to include students and improve their physical literacy. I believe that every child deserves a chance to play regardless of ability level. We want to develop and help all of our students and not just the most athletic. The school setting is the best setting to develop everyone’s physical literacy. Being part of a sports team or an intramurals program isn’t about winning a banner or a trophy at the elementary level. It’s so much more than that. It’s about having fun and creating positive relationships while being active. Students are given lots of opportunities to participate in other physical activities during the school year. Our school-wide activities allow all of our students to participate and enjoy themselves by developing their sports and movement skills. Often, our students even discover a new passion and pursue it outside of the school environment. We strongly believe that recess is essential for our students’ health. Whether they are using the time to quietly recharge with friends or climbing on the structure, playing tag, or organizing impromptu soccer games, recess provides a much needed break. Our students also need adventurous play. Adventurous play allows children to test their bodies and improve their physical literacy. My colleagues and I are responsible for eliminating hazards, such as cleaning up broken glass or verifying the safety of play structures, so that our students can have adventures without hurting themselves. The five pillars are designed to help our students develop their physical literacy by providing them a variety of physical activities and social experiences. We want our students to be knowledgeable, confident, motivated, and physically competent. We also want them to be socially, mentally, and physically healthy. I really enjoy working at École élémentaire publique Jeanne-Sauvé because we truly do have the foundations of a healthy school. The number of people who are obese and overweight in the world is increasing, and Canada’s no exception. A report released Tuesday by the World Obesity Federation (WOF) takes an in-depth look at what obesity rates will be like globally by the year 2025. And it says the findings are an indication that changes need to be made urgently. According to the report, the global cost of treating obesity-related illnesses will be US$1.2 trillion each year beginning in 2025. By the same year, there will be an estimated 2.7 billion overweight and obese people in the world — that’s a third of Earth’s population. The country with the most concerning obesity prognosis is the United States, which is expected to spend US$555 billion treating obesity-related problems in 2025 alone. The number of people living with obesity in America will be nearly 108 million.In Canada, more than 10 million adults (34 per cent of those over 18 years) will live with obesity in eight years. Treating health problems caused by the excessive weight, such as heart disease, diabetes, liver disease and certain cancers, will cost the country US$27.5 billion (roughly C$33.7 billion) each year. And between 2017 and 2025, the total cost of treating those illnesses will be US$207 billion. In a statement emailed to Global News, the president of WOF, Ian Caterson, explained obesity has “risen dramatically” over the past decade. The report suggests that the increasing cost of treating these illnesses can be reduced if countries invest in preventing and curbing obesity. If Canada invests $4.2 billion in treating obesity, the percentage of Canadians dealing with the problem could be reduced to 29 per cent from 34 per cent. The report adds that countries should spend more on providing treatment services to people already living with obesity, along with early intervention and prevention. Costs for treatment should be covered by the health-care system and/or insurance companies, the WOF said. There should also be clear ways of seeking help, with access to medical professionals, pharmaceuticals and medical devices. The federation adds that anyone seeking help with weight management should have educational materials and guidelines available to them, free consultations and workplace support. In an August report, Statistics Canada found similar rising numbers on obesity, with 26.7 per cent of Canadians who were obese in 2015, up from 23.1 per cent in 2004. It noted that Saskatchewan has the highest obesity rate, with 45.9 per cent of adults falling into that category. British Columbia has the lowest rate of adult obesity, at 21.4 per cent. According to the Canadian Obesity Network, seven million Canadians are currently living with the weight condition, but the country isn’t properly helping those affected. An April report by the organization gave every province a failing grade on the issue. “The problem with obesity is that although we have recognized it as a chronic disease, when you go to your doctor, often what you get told is to lose weight, but then you’re pretty much on your own with that,” Dr. Arya Sharma, scientific director of the Canadian Obesity Network, told Global News at the time. The report noted several shortcomings. Anti-obesity medications aren’t covered by any provincial or territorial drug benefit plan. The report added that there are “very few” medically supervised weight-management programs, and they often cost thousands of dollars. Perhaps the most troubling statistic out of the report is that only 40 physicians in Canada have formal training and certification to address obesity and weight management. There are more than 80,000 physicians in the country. Ms. Elena’s Head Start classroom is filled with eager 3- and 4-year-olds. It’s center time, and the children have split into small groups. At one center, Ms. Elena has carefully selected play materials—including a barn, a chicken coop, and animal figurines—that reflect the story lines and specific vocabulary words from books she read aloud related to farm life as part of the class’s storybook theme of the week. While Ms. Elena looks on, Sara, Javon, and Ashish arrive at the center and immediately pick up the toys. They each choose a figurine and begin playing. Sara says to Javon, “I’ll be the cow!” Javon says, “Okay, then I’ll be the chicken. I’m going to go sleep in the coop. The cow should go sleep in the barn.” Ashish says, “Then I’ll be the horse, and I’ll go sleep in the barn too.” Together, the three children move their figurines to the coop and the barn while making mooing, clucking, and neighing sounds. Since coop was one of the week’s focus words, Ms. Elena joins in the children’s play, making sure that Sara and Ashish understand the word as well as Javon: “Sleeping in the coop sounds like a great idea, Javon! A coop is a house for chickens. Remember when we saw a coop on our field trip to Maple Farm? Javon, Sara, and Ashish, where do you think the chickens would live if we didn’t have a coop on the farm?” Ashish says, “I think they live in the barn!” Then Sara says, “Yes, they live in the barn, because it’s nice and warm inside there.” Ms. Elena says, “That sounds like a really good place for the chickens to live if we didn’t have a coop!” At this point, Ms. Elena steps back and the children take up a new direction for the play. She continues to listen for ways to build on the children’s interests and reinforce children’s interests and reinforce their weekly focus words during the session without interrupting their play. Why Play? Monkeys play. Dogs play. Rats play. Even octopuses play. And without any instruction, children of all races and genders, in all cultures of the world, invent and reinvent play in every generation. Something this ubiquitous must provide evolutionary advantages to both animals and humans. Decades of research suggest just that. In particular, free play and guided play—together known as playful learning —are pedagogical tools through which children can learn in joyful and conceptually rich ways, as is evident in the opening vignette. Brain science research in animals has left clues along a path that may begin to reveal play’s human biological underpinnings, but more research is needed to investigate play why promotes learning and development. From animal brains to children’s behavior perhaps the most striking finding about play comes from research with animals in which play—specifically, rough and tumble play—has been shown to promote early brain development. When young rats play, their brains become primed to be more adaptable in later life (Pellis, Pellis, & Himmler 2014), especially with social skills and executive functions (e.g., attention, memory, and planning). Indeed, findings suggest that playful rats act more appropriately in social situations than rats that do not play (Burgdorf, Panksepp, & Moskal 2011). These findings offer a potential model of how play may help develop children’s social functioning and brain architecture. A growing body of behavioral research establishes relationships between children’s play and development in several areas, including language (Toub et al. 2016), executive functions (Tominey & McClelland 2011), mathematics and spatial skills (Fisher et al. 2013), scientific thinking (Schulz & Bonawitz 2007), and social and emotional development (Dore, Smith, & Lillard 2015). One reason that play might be such a valuable pedagogical tool is that it features the precise contexts that facilitate learning. An amalgamated research field called the has identified four key ingredients of successful learning: learning science of learning occurs best when children are (not passive), (not distracted), mentally active engaged socially interactive (with peers or adults), and building to their lives (Hirsh-Pasek et al. 2015). These meaningful connections features are evident in Ms. Elena’s classroom: Javon is mentally active when he thinks about where he learned the name of the place where chickens sleep and then uses the word coop appropriately. Sara is engaged when she chooses to be the cow and moves in concert with Javon and Ashish instead of being distracted by other groups at play. Ms. Elena made the word coop more meaningful for the children by making a connection to when the children visited Maple Farm. Finally, the children were socially interactive when they built a play scenario that involved all three of them, with Ms. Elena joining in as a scaffolder. These kinds of playful interactions between children and adults may be essential for creating the kind of supportive social environments necessary for healthy social and emotional development. Guided play in particular features this type of social interaction and has demonstrated promising outcomes for learning particular features this type of social interaction and has demonstrated promising outcomes for learning and development. What is guided play? Today, most researchers agree that play is fun, flexible, voluntary, and intrinsically motivated; it involves active engagement and often incorporates make-believe (Sutton-Smith 2001; Pellegrini 2009; Fisher et al. 2010; Lillard et al. 2013). Guided play maintains the joyful child-directed aspects of free play but adds an additional focus on learning goals through light adult scaffolding (Weisberg et al. 2016). It offers an opportunity for exploration in a context specifically designed to foster a learning goal. As such, it features two crucial elements: child agency (the child directs the learning) and gentle adult guidance to ensure that the child progresses toward the learning goal. Research suggests that guided play is a successful pedagogical tool for educators in a variety of areas (Weisberg et al. 2016). Here, we outline some examples of how guided play can work in the classroom to build specific language, mathematics, and spatial skills. Language Development Guided play features child agency and gentle adult guidance toward the learning goal. Guided play is a model setting for language learning. For example, infusing vocabulary instruction in guided play fosters word learning for preschoolers, especially those from disadvantaged backgrounds (Toub et al. 2016; Han et al. 2010). One study tested the effectiveness of word learning through guided play against a more teacher-directed learning activity (Toub et al. 2016). All children participated in shared book reading and then reviewed half of the vocabulary words through guided play and the other half through a picture card word-recall activity. The guided play resembled the learning taking place in the opening vignette. After play-based word learning, children defined the target words more readily than they did after picture card-based word learning. Mathematics and spatial skills Guided play is also effective for fostering spatial skills—important in and of themselves and also tied to later mathematics success (Verdine et al., forthcoming). For example, a study with preschoolers (Fisher et al. 2013) compared children’s ability to learn about geometry and shapes through guided play, free play, and direct instruction. In the guided play condition, the adult followed the children’s lead and scaffolded the interaction. Children learned more about geometry and shapes than those participating in either the direct instruction condition, where the children listened passively while the adult delivered the content in a fun way, or the free play condition, where children interacted with the shapes in whatever way they wished. To envision how a similar effect might occur in the classroom, imagine a different center in Ms. Elena’s room: Pablo, Keisha, and Nari arrive at a table filled with tiles of different shapes. They all pick up pieces and begin snapping Magna-Tiles together. Nari says, “I’m going to build a tower! I can’t get these pieces to fit.” Ms. Elena is observing the children and chooses this moment to join in and say, “What shapes do you have, Nari?” Pablo says, “Nari has a square.” “That’s right, Pablo. Nari has a square. Nari, can you find another square?” Nari holds up a square. Ms. Elena says, “What makes that a square?” She pauses to let the children think about it, then continues, “It has four sides that are all the same length.” She then says, “I wonder if it’s possible to make a bigger square using the pieces you are holding up.” Keisha says, “Hmmm … I want to try!” The children look at each other and lay the pieces down—eventually discovering that by putting all four of the squares together, they create a larger square. Ms. Elena notices their discovery, and four of the squares together, they create a larger square. Ms. Elena notices their discovery, and says, “Wow! You made a bigger square! It still has four sides, and all of the sides are the same length.” Ms. Elena wove the definition of a square into the children’s play without taking over, but she also encouraged the children to push themselves to make an important discovery about the shape tiles. Guided play allows teachers to piggyback on children’s joy and engagement to reinforce important skills. Why does guided play work? Fledgling evidence from brain science Guided play represents an approach to learning that increases children’s knowledge enhanced discovery through opportunities to receive immediate, meaningful adult feedback (Alfieri et al. 2011). It is also an ideal example of an active, engaged, meaningful, and socially interactive learning context (Hirsh-Pasek et al. 2015). Consider, for instance, children playing with a shape sorter. The children discuss how to insert the shapes so that the sorter lights up. They keep inserting shapes and notice that sometimes the sorter lights up and sometimes it doesn’t, but they can’t figure out why. Their teacher joins in and makes some gentle guiding suggestions to help them by asking what the children have already tried and what they could try next. As children incorporate this feedback while continuing to experiment, they generate hypotheses and draw causal connections, becoming little scientists. Play helps children discover causal relationships through this type of informal experimentation (Schulz & Bonawitz 2007; Gopnik 2012). And light scaffolding, when needed, prevents frustration and enables the children to engage in longer periods of playful experimentation. Adult-scaffolded play experiences might be particularly important because they help children develop what scientists call : neural mechanisms in the brain’s prefrontal cortex that use clues from the proactive control environment to help the brain figure out what might happen next (Weisberg et al. 2014). Guided play might support the development of proactive control by fostering a —a term (derived from the mise en place culinary world meaning “everything in its place”) suggested by the famed psychology professor Jerome Bruner (2013, personal communication with Brenna Hassinger-Das): Think about preparing to make a pizza. You gather the dough, sauce, cheese, and toppings. You also get out the required tools: rolling pin, pizza stone, and pizza cutter. In this way, you have prepared yourself and your workspace for the task at hand. Similarly, a psychological —a readiness to anticipate events and explore an activity mise en place (Weisberg et al. 2014)—helps children prepare their minds to embrace learning experiences in a positive way. Ms. Elena cultivated such a through her inclusion of farm-focused play activities. By mise en place preparing the play environment in service of her pedagogical goal—the children learning the focus words—Ms. Elena allowed children to work toward this goal in their own playful way. This type of gently scaffolded, playful learning fosters children’s desire to seek out similar meaningful learning opportunities (Weisberg et al. 2014). Imagine a different week in Ms. Elena’s classroom. She sets up one center with a castle play set that mirrors a book read during that week’s storybook theme of knights and dragons. The prepared play set encourages children’s organic use of the theme’s vocabulary words while playing—words like and talons . Ms. Elena can then draw attention to these words and help children make meaningful connections to them. This type of adult support during guided play may be the mechanism through which children’s fledgling proactive control mechanisms emerge (Weisberg et al. 2014). Guided play increases children’s knowledge through immediate, meaningful adult feedback. (Lillard et al. 2013, 28). Alfieri, L., P.J. Brooks, N.J. Aldrich, & H.R. Tenenbaum. 2011. “Does Discovery-Based Instruction Enhance Learning?” 103 (1): 1–18. Journal of Educational Psychology Burgdorf, J., J. Panksepp, & J.R. Moskal. 2011. “Frequency-Modulated 50 kHz Ultrasonic Vocalizations: A Tool for Uncovering the Molecular Substrates of Positive Affect.” Neuroscience & Biobehavioral Reviews 35 (9): 1831–36. Dore, R.A., E.D. Smith, & A.S. Lillard. 2015. “How Is Theory of Mind Useful? Perhaps to Enable Social Pretend Play.” 6. Frontiers in Psychology http://journal.frontiersin.org/article/10.3389/fpsyg.2015.01559/full . Fisher, K.R., K. Hirsh-Pasek, N. Newcombe, & R.M. Golinkoff. 2013. “Taking Shape: Supporting Preschoolers’ Acquisition of Geometric Knowledge Through Guided Play.” 84 (6): Child Development 1872–78. Lillard, A.S., M.D. Lerner, E.J. Hopkins, R.A. Dore, E.D. Smith, & C.M. Palmquist. 2013. “The Impact of Pretend Play on Children’s Development: A Review of the Evidence.” 139 (1): 1–34. Psychological Bulletin Pellegrini, A.D. 2009. “Research and Policy on Children’s Play.” 3 (2): Child Development Perspectives 131–36. T.S., B. Hassinger-Das, H. Ilgaz, D.S. Weisberg, K.T. Nesbitt, M.F. Collins, K. Hirsh-Pasek, R.M. Golinkoff, D.K. Dickinson, & A. Nicolopoulou. “The Language of Play: Developing Preschool Vocabulary Through Play Following Shared Book-Reading.” Manuscript submitted for publication, 2016. Weisberg, D.S., K. Hirsh-Pasek, R.M. Golinkoff, & B.D. McCandliss. 2014. “Mise En Place: Setting the Stage for Thought and Action.” 18 (6): 276–78. A Stanford study shows that recess is a profoundly important part of the school day. Well-organized recess programs engage students in meaningful play and prepare them to learn once back in the classroom. Stanford research published in the “Journal of School Health” shows the benefits to children and the school climate when well-organized recess is part of the school day. A high-quality recess program can help students feel more engaged, safer and positive about the school day, according to Stanford research. In fact, recess can yield numerous benefits to an elementary school’s overall climate, said Milbrey McLaughlin, the David Jacks Professor of Education and Public Policy, Emerita, founding director of Stanford’s John W. Gardner Center, and a co-author of the journal article. Prior research attests to the importance of play or recess time for children, McLaughlin and her colleagues wrote. For example, the United Nations Office of the High Commissioner for Human Rights recognizes the right of all children to play, regarding it as an essential part of their well-being, especially for the economically disadvantaged. And the state of California now includes school climate as one of eight priority areas for local education agencies. “The quality of recess is in question,” they wrote. Because recess offers opportunities for both positive play and experience in learning how to resolve conflicts, it can have powerful implications for a child’s education, McLaughlin said. The researchers examined six low-income elementary schools during the 2009-10 school year that had implemented a non-profit organization’s recess-based program aimed at encouraging a safe, healthy and inclusive environment. Trained, full-time “coaches” were sent into low-income elementary schools with the goal of improving recess. They worked with students to establish recess games with a common set of rules, introduced conflict-resolution tools, and encouraged positive language and inclusive behavior. Each school had two recess periods during the day. The findings were based on teacher, principal and recess coach interviews; student focus groups; recess observations; and a teacher survey. Schools on the opposite ends of the recess spectrum – good and poor – were compared as well. Adults are integral to a well-rounded recess experience, McLaughlin said. Five school-age children are hopping across tree stumps and thick branches as part of an obstacle course — but it’s not a phys ed class. Another group of children have built a teeter-totter out of a wide board and a log — but it’s not recess. They’re all wearing running shoes, their jeans mud-streaked and hair wind blown — but it’s not summer camp. It’s just a typical day for students enrolled in Maple Ridge, B.C.’s Environmental School Project, where math, science, literacy — and physical literacy — are learned in a revolutionary new way. The students here take all of their classes outdoors, because in this public school there are no classrooms. A partnership between Simon Fraser University, School District 42 Maple Ridge & Pitt Meadows, and several other community groups in the mountainside city, the Environmental School launched in 2011 and recently expanded from a Kindergarten to Grade 7 program to include Grade 12. Unlike traditional schools where the learning takes place in a classroom with students dutifully seated at desks, learning at the Environmental School is place-based, meaning that lessons are learned from the surroundings, whether it’s in the woods, at the riverside next to salmon spawning grounds, or in the wetlands. Craig Cerhit was skeptical at first. Cerhit, a documentary filmmaker, enrolled his son, Nate, in the program as a kindergarten student. His son is now in Grade 4, and Cerhit has become firm believer in the benefits of taking education outdoors. So much so that he spent two years documenting the daily lives of the staff and students for his film Found in the Forest. “We spent the first couple of months of school at a beautiful park located next to a river. And the thing that I let go of immediately was that the whole idea that they weren’t in a classroom and sitting in chairs. Being outside in the natural world is full of stimuli and it’s relaxing,” Cerhit shared in his 2015 TEDxSFU talk last November. “It proved to me to be an amazing place to learn in. It calmed everyone down,” he remarked. The outdoors offers endless opportunities for students to develop their physical literacy. Fundamentals like hopping, jumping, running, balancing, and agility can all be incorporated on a hike through the woods. Fort building, a common activity at the school, develops raising and lowering skills, with students lifting and placing sticks and logs into place. Fine motor skills are developed when students lash the fort together. The simple fact that there are no desks or chairs at the Environmental School mean that squatting or sitting on uneven surfaces invite children to use their bodies in new ways when working on assignments. Yes, students at the Environmental School have to complete assignments. However, it’s events, like two weeks at a BMX pump track, that bring the student’s physical literacy skills into focus. Kids who once were unable to participate in family bike rides now had the confidence and strength to keep up with their families, which turned bike riding into a part of their daily lives. Under the direction of a BMX Canada coach, the riding skills of the students flourished. Some students even decided to start competing in the sport. The model of the Environmental School may not be suitable for all school districts, but it does offer inspiration to educators and parents who are struggling with curriculums that are technology-focused, or schools that are cutting back on physical education and recess time. Taking lessons outdoors, having recess in the rain, or incorporating more opportunities for exploring the natural world into field trip schedules are all achievable ways for educators to reimagine their classrooms. Schools may not all have forests in their backyards, but by opening the doors and letting education spill outside, parents and educators can open their minds to the possibility that physical literacy can be best discovered outdoors. Here are links to a few organizations in Canada that cater to this very concept. Check them out and share in the comments below if you know of any others in your region.